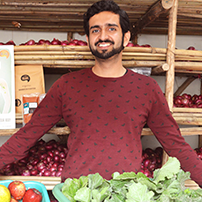 Ashmeet is the founder of I Say Organic , a company working towards making organic products in India conveniently available and accessible, with the belief that consumer demand will lead the shift towards ecological agriculture, making it more the norm than exception. He started the company after traveling widely across the country, which inspired him to tap into the enormous potential agriculture presents to create prosperity while addressing the various environmental and economic threats the country faces. Ashmeet holds a Masters in Innovation Management & Entrepreneurship from Brown University, and Bachelors in Electrical Engineering from University of BritishColumbia.